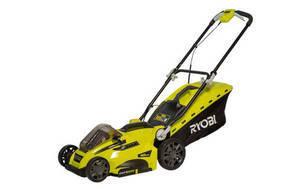 Snapshot: The Ryobi Cordless 36V 4.0AH RLM36X40H40 is a catcher-only battery-electric mower that weighs 16kg and has a cutting width of 40cm. But is it a smooth operator? Very easy to push and manoeuvre. Catcher a little awkward to remove, empty and replace. Brushed motor, smaller battery version of brushless RLM36X46 5.0Ah. "Can't figure out why this rating is so low"
01 Nov 2018, Cliff V.
I was suspicious of electric mowers in general, and this one in particular because of this rating, but now that I've tried it I'm really impressed. Sturdy, light-weight (which I needed, since I've got major side-hills), and best of all, long-lasting in the battery stakes. I can do all our lawns, including those hills, and only use half the battery. One thing I really like is being able to stop the mower when the slope gets dodgy, then not have to pull at a cord again once I get things realigned. Would have been nice if the handles locked when collapsed. As it is, they can flop around when you pick up the mower by its handle. It could also use a second handle, since the mower is a bit heavy to pick up with just one hand/arm. 28 Oct 2018, Philip L.
Great on steep hills as so light. And the safety switch means you only have to let go for the blades to stop!. I'm in my 70's and feel totally comfortable with this mower on steep hills where a petrol engine mower was impossible for me. Light, easy set up, starts first time, cuts well. Catcher has good capacity.... i really like my new mower. Battery charges very fast.... and holds its charge equally well. Ideal for a lawn that takes up to an hour to mow. Mine takes 20 min. 27 Oct 2018, Sharon M.
Best choice ever I am 70 next year and it is so easy to start, empty catcher, height adjustment simple and not heavy to carry. I would never go back to a petrol pull start mower, I really love it.